Tag Huer Formula 1 Quartz Mens Watch with Black Dial and White numerals, Stainless Steel. Are you a manly man? So manly that you need a secretary to keep tack of you many manly and athletic events? There is snowboarding on Monday, surfing on Tuesday, mountain biking on Wednesday, race car driving on Thursday, sky diving on Friday, basketball with the guys on Saturday, and Sunday, well Sunday is wildcard day. If you’re looking for a watch that can keep up with your macho man lifestyle, keep reading for a review on Tag Heuer’s Formula 1 Quartz Mens Watch WAH1110.BA.0858. If you haven’t figured it out yet, this watch is designed to accompany your athletic and action oriented lifestyle. Jumping off a waterfall? You’re all set with water resistant at 660 feet. Don’t have time to wind your watch? All good this watch is battery operated Swiss quartz. Got to know the time fast to make sure you get to your next extreme sport appointment? No problem. 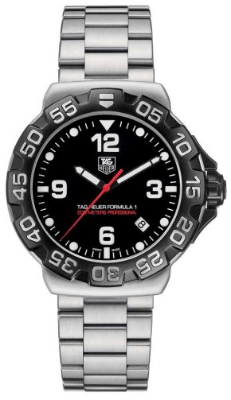 The Tag Heuer Formula 1 has Arabic numerals marking the time at the 3,6,9, and 12 o’clock positions, with dot hour markers in between, and the minutes on the outer rim. The time is also easy to see since the black dial makes the white numerals and marking pop out, and the luminous hands are easy to locate. What else goes into the Formula 1 watch, you may ask? The 41 mm case, and 22mm bracelet are made of Stainless steel with a unidirectional black, PVD titanium bezel. The bracelet stays securely fastened to your wrist with a fold over push button clasp. The dial is protected by scratch resistant sapphire crystal. The crown is screwed down and the case back is solid. Pros: High water resistance, date display in between the 4 and 5 o’clock position, 2 year warranty from specific sellers, low cost for a designer watch $649-$801 online. Cons: They say that this watch is versatile in that you can wear it not only to your extreme sport functions but also to your “cool evening events”. I would say because of how bulky and very sporty the outer rim is, you won’t be seeing it at too many black tie affairs. Tag Heuer has built up quite the reputation in the competitive sports world. They have provided timing services at events such as the Olympic Games, FIS Ski World Cup, and the FIA Formula I World Championships. Want to hear about celebrities wearing Tag Huer? Golfer Tiger Woods wears one as well as Spanish race car driver Fernando Alonso. This watch is ideal for the ever going, never stopping, athletic enthusiast, or any other man that wants a sports watch with style and a well known reputation. Besides the WAH1110.BA0858 there is also its variation of orange numerals, hour and minute markers, plus orange hands, against the black dial. Also to be mentioned, if you aren’t a fan of steel bracelets you can also switch it up for a variation with a black rubber strap instead. Great review from a writer who clearly knows these watches very well. How is Alfonso Fernando going this year? He is my favourite driver after Hamilton Lewis.